HELL has frozen over in New Zealand after South Africa smashed the All Blacks' immortal home test record with a famous win in Wellington. 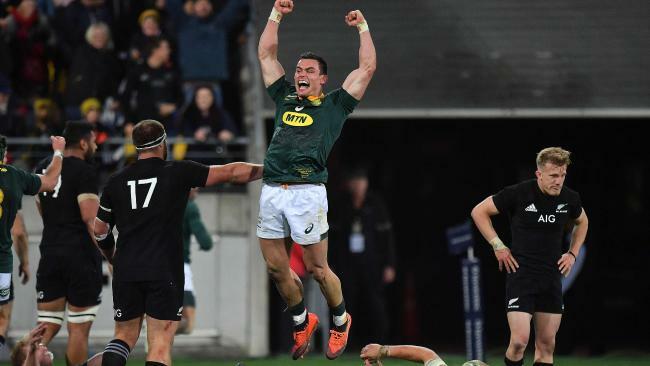 In a result that seems destined to be remembered for a very long time, South Africa had to defend a devastating All Blacks attack well into the 84th minute before a handling error finally handed them a well-deserved victory. It was also New Zealand's first loss in the Rugby Championship since 2015 - 15 tests. The Springboks narrow lead was then pushed to breaking point when Willie le Roux was given a yellow card ans sent to the sin bin in the 68th minute for holding an All Blacks player down during a linebreak. His try Beauden Barrett a chance to tie the game with his conversion from 10m to the right of the posts, but his kick clunked into the right upright.